DISCOVER THE UNSUNG HEROES OF 20TH CENTURY BRITISH COLUMBIA THROUGH THIS FEATURED EXHIBIT AT THE MARITIME MUSEUM OF BC, PRESENTED IN COLLABORATION WITH PARKS CANADA. With an emphasis on the Pacific Northwest Coast during the two world wars, you will be met with remarkable stories of determined Canadian men and women on the home front who toiled in shipyards building vessels for the Merchant Navy, and those who sailed these ships through perilous waters at great personal sacrifice delivering vital supplies to war fronts around the world. Also featured, learn about the tragic story of the HMCS Galiano which went missing a century ago during World War I. 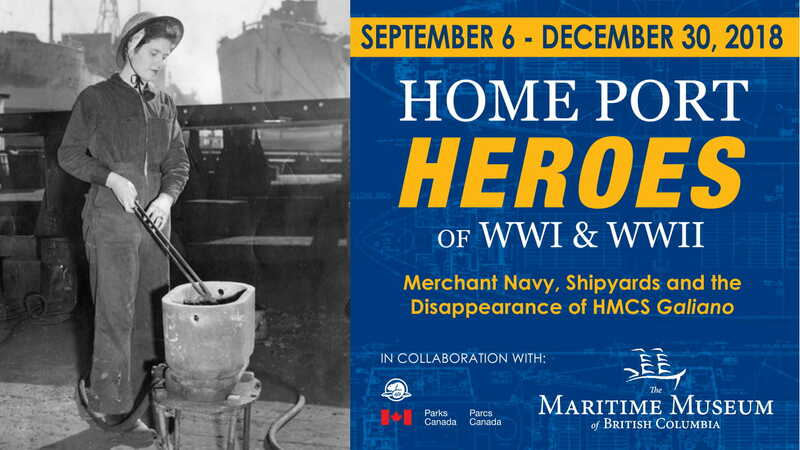 Test your mariner skills at reading Morse code and tying nautical knots, watch authentic short films about Canada’s WWII efforts at sea, and get up close with a female shipyard worker.